Software speed and connection is excellent. Soft competition at high stakes. Low variety of game types. Most people already know of Party Poker before their first visit. It is the largest and most well-known poker room in the world. Big does not mean great, however. The room sports the best tournaments and excellent promotions, but lacks in software, loyalty rewards and sign up bonuses. EveryPoker.com recommends this room to anyone who enjoys a tournament every now and then, even at the higher stakes. You will meet lots of new people and chances are, you will run into quite soft competition. You are looking at the software of the most popular poker rooms on the Internet. Unfortunately, the software isn’t of the top notch class you would expect it to be. The interface is stiff and the poker tables are a bit pale. Despite this, Party Poker has a sturdy solution, not for its graphics, but for the very fast-loaded and simple software. We like the very extensive menu system where you can access virtually all the information you need, except for hand statistics. 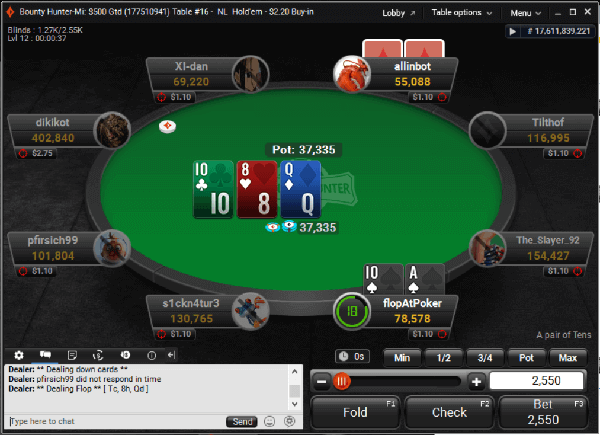 The software allows you to play at four tables, which is fully acceptable. In short, it’s very functional, fast and reliable, but not very extensive. If you are looking for competition, Party Poker won’t let you down. It is the largest poker network on the internet and hosts 70,000 connected players at peak times. About 20 percent of the connected players participate in cash games (tournaments excluded in this number). Party Poker host a large number of tournaments. Over 20,000 players participate simultaneously in cash games. The focus is on Texas Hold’em Limit and No Limit, but you can find 7 Card Stud, 7 Stud Hi/Lo and Omaha Hi/Lo. Low buy-in tables are obviously the most popular, ranging from $5 to $30. The highest buy-in stays at $200. Multi tables, single tables, regular tournaments, special tournaments and shootouts. You name it, Party’s got it. If you prefer Texas Hold’em, Omaha Hi/Lo, 7 Card Stud or 7 Stud Hi/Lo over other types of poker games, then Party Poker may be worth your attention. Further on, there is no heads up mode, nor will you find any turbo games. Fortunately for all low budget poker fans, Party Poker host freeroll tables for all its mentioned game types. As a big plus, single tables are available too. 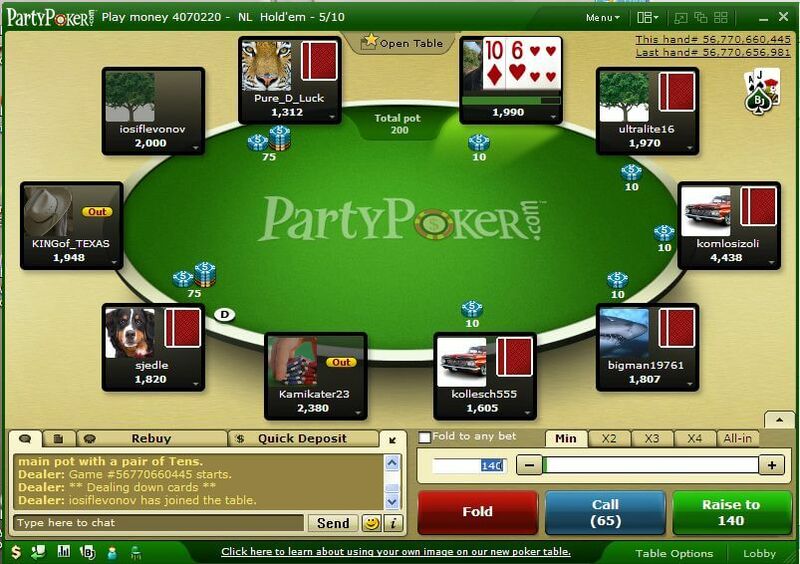 Party Poker does not offer the softest competition but certainly stays close to the leaders. Because of the large amount of players, you will find fishes and sharks. In most situations, you will be able to tell who’s what. Fortunately, the massive media attention brings not only average Joes, but also people with more than just a few bucks in the wallets. Many of the fish lure in the mid stakes, even as high as $5/$10. You can claim a bonus of 100% and up to $500. After you use the Party Poker bonus code, you must meet the bonus requirements to claim the maximum bonus. Aside from the sign up bonus, Party Poker offers various re-deposit bonuses ranging from 15% and up. Most importantly, however, is the Party Points shop which lets players cash in on gifts and real cash. Players use the Party Points system to purchase these products. The deep Party Poker pockets do great impact on the promotions. First and foremost the PartyPoker.com Million Cruise, an annual boat cruise in the Caribbean for its satellite winners. Other activities include tournaments with special prizes, such as cars or big cash sums. The bonus system also rewards players based on the raked hands. You receive $50 for referring a friend, plus the $25 that will be transferred to your friend’s account. The telephone support is superb. Our test calls during peak times resulted in response times within three minutes. The live desk support is very fast and reliable, too. E-mail correspondence is average, although a bit too slow compared to the quality of the other two support lines. Deposits: credit Card, Neteller, FirePay, Western Union, Citadel, eChecks (iGM-Pay), bank draft, cashier’s check, regular check and money order. Cash-outs: Neteller, wire transfer, eChecks (iGM-Pay) and check.